Some of the most rigorous moral thinkers of the past century have spent time on the wrong side of questions they deemed of vital importance. Mohandas Gandhi, for example, at first remained loyal to the British, manifesting many of the vicious prejudices of the Empire against Black South Africans and lobbying for Indians to serve in the war against the Zulu. Maya Jasanoff in New Republic describes Gandhi during this period of his life as a “crank.” At the same time, he developed his philosophy of non-violent resistance, or satyagraha, in South Africa as an Indian suffering the injustices inflicted upon his countrymen by both the Boers and the British. Gandhi’s sometime contradictory stances may be in part understood by his rather aristocratic heritage and by the warm welcome he first received in London when he left his family, his caste, and his wife and child in India to attend law school in 1888. And yet it is in London that he first began to change his views, becoming a staunch vegetarian and encountering theosophy, Christianity, and many of the contemporary writers who would shift his perspective over time. Gandhi received a very different reception in England when he returned in 1931, the de facto leader of a burgeoning revolutionary movement in India whose example was so important to both the South African and U.S. civil rights movements of succeeding decades. The prejudice against color and in some respects against Asians is intense in that Colony….The climax was reached three years ago, with a law that many others and I considered to be degrading and calculated to unman those to whom it was applicable. I felt that submission to a law of this nature was inconsistent with the spirit of true religion. Some of my friends and I were and still are firm believers in the doctrine of nonresistance to evil. I had the privilege of studying your writings also, which left a deep impression on my mind. God help our dear brothers and co-workers in the Transvaal! Among us, too, this fight between gentleness and brutality, between humility and love and pride and violence, makes itself ever more strongly felt, especially in a sharp collision between religious duty and the State laws, expressed by refusals to perform military service. 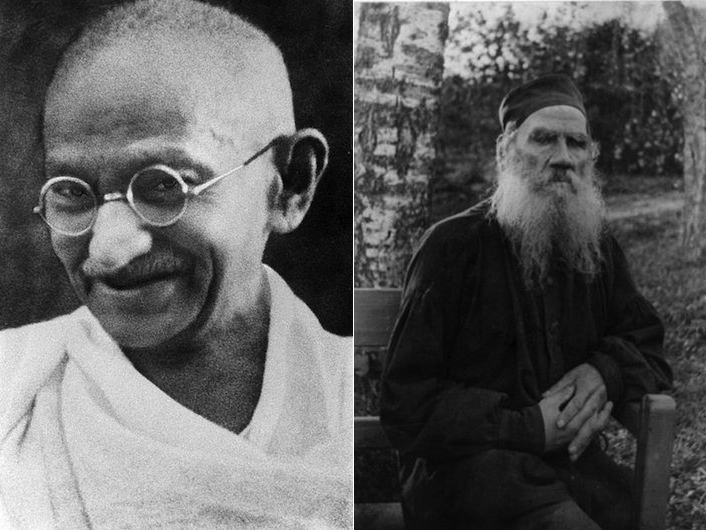 The two continued to write to each other, Gandhi sending Tolstoy a copy of his Indian Home Rule and the translated “Letter,” and Tolstoy expounding at length on the errors---and what he saw as the superior characteristics---of Christian doctrine. You can read their full correspondence here, along with Tolstoy’s “Letter to a Hindu” and Gandhi’s introduction to his edition. Despite their religious differences, the exchange further galvanized Gandhi's passive resistance movement, and in 1910, he founded a community called "Tolstoy Farm" near Johannesburg. Gandhi's views on African independence would change, and Nelson Mandela later adopted Gandhi and the Indian independence movement as a standard for the anti-apartheid movement. We're well aware, of course, of Gandhi's influence on Martin Luther King, Jr. For his part, Gandhi wrote glowingly of Tolstoy, and the model the novelist provided for his own anti-colonial campaign. In a speech 18 years later, he said, "When I went to England, I was a votary of violence, I had faith in it and none in nonviolence." After reading Tolstoy, "that lack of faith in nonviolence vanished...Tolstoy was the very embodiment of truth in this age. He strove uncompromisingly to follow truth as he saw it, making no attempt to conceal or dilute what he believed to be the truth. He stated what he felt to be the truth without caring whether it would hurt or please the people or whether it would be welcome to the mighty emperor. Tolstoy was a great advocate of nonviolence in his age." How can we apply non violence to the fundamental religious based groups who are driving whole populations out of their countries to be forced upon other countries which creates more violence from a non violent sectors. Non violence is the prerequisite to stop violence amongst any groups, not just fundamental religious groups. It is the fundamentalism itself that creates a chism if it doesn’t incorporate nonviolence. Once violent, it promotes violent reaction, or proactions. the question is how to reduce or remove violence as a form of existence in human beings. Socio-economic struggles promote violence as a means of survival (of the fittest). If we can reduce that struggle to survive, we can reduce the violence.